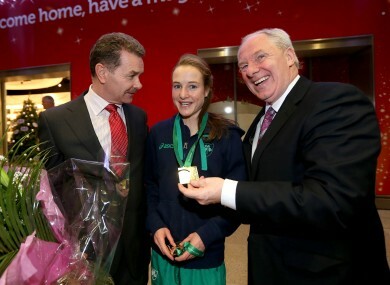 Professor Ciaran O'Cathain of Athletics Ireland, Fionnuala Britton with her medals and Minister of State for Sport Michael Ring. NOT SINCE FORMER Taoiseach Charles Haughey showed up on the Tour de France podium to help Stephen Roche celebrate his 1987 win has a politician displayed such commitment to photo opportunities. Minister of State for Sport Michael Ring happened to be in Dublin Airport last night when Fionnuala Britton and the Irish Women’s Cross Country team stepped through the automatic doors in the arrivals hall. Five gold medals hung around four necks [Britton had two] and Minister Ring was positively chuffed about the whole thing. The Mayo TD allowed Ciaran O’Cathain of Athletics Ireland to present the team with bouquets of flowers before squeezing in for some pictures. Going back through the photo archives [selection included below], it seems Minister Ring has had a busy six months of photo opportunities with Irish sports stars and at top sporting events. Jim McDaid, as Minister for Sport in 1996, was at the airport [back when it had one, paltry terminal] to welcome Michelle de Bruin returned back from the Atlanta Olympics with three gold medals and a bronze. A year later, as de Bruin returned in triumph from the European Championships, but with drug controversies dogging her wins, McDaid was absent. He argued at the time that the spotlight should not be shared with a politician. Under pressure for the no-show, McDaid turned up a week later for a reception held for de Bruin by sponsors TNT. You hug Trap, I'll hold the stick. Email “Your 'Oh, you're at Dublin Airport too' pic of the day”. Feedback on “Your 'Oh, you're at Dublin Airport too' pic of the day”.